We’re gearing up for some wonderful summer months and hope you are too! Our goal at TextMyJournal is to preserve as many stories as possible. 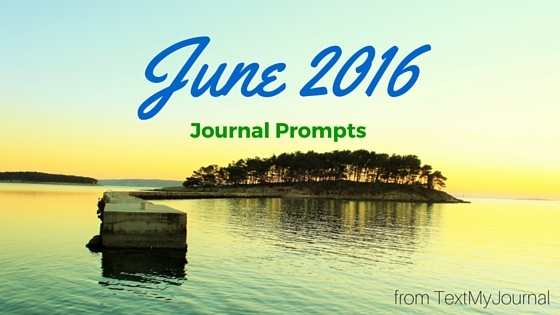 We hope preserving those stories gets a little bit easier with these journal prompts. Check back each month for more, and feel free to share! How do you spend your summer months? What did you do today outside your comfort zone? Write about an outfit you had as a child. What religious holidays are significant in your life? How would your life be different if you were 10 years younger? How do you experience fear? What was your favorite summer treat as a child? Whose relationship do you admire? What one thing will you work on for one week? Where does your family come from? Who would you interview if given the chance? What does your flag mean to you? What subject in school was your favorite? Write about your success from your weekly goal. If you could have a picnic anywhere, where would it be? Write a letter about (or to) your father. How will you spend the summer solstice? When was your last victory? Who do you miss from your childhood? Write about your favorite memory with water. What goal would you like to accomplish in the next year? How did your home shape your character? What word or phrase is significant to you? How have you changed this month? When do you feel helpless? What one thing would you like to accomplish in July?